Economic Development is the number one priority of our Board of County Commissioners. St. Johns County, in northeast Florida, is a highly-desirable, amenity-rich location of choice for starting, relocating, or expanding your business. Bordered by the scenic Atlantic Ocean and St. Johns River, St. Johns County embraces its historic heritage and uniquely diverse communities such as the City of St. Augustine — the Nation's Oldest City; St. Augustine Beach, Ponte Vedra, and Hastings — the Potato Capital of Florida; which have attracted visitors for centuries. 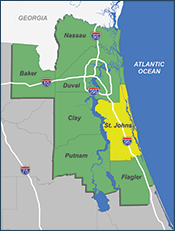 Capitalizing on its global appeal, St. Johns County is poised for economic growth through its strategic location, favorable climate, local economic development incentives, and outstanding community services. Economic development is the number one priority of our Board of County Commissioners. The Board shares a unified commitment to attract new business development, to expand and diversify the tax base, and to create jobs for our local residents. St. Johns County Economic Development Office is the designated primary partner with Enterprise Florida, the state’s economic development organization. Our office provides assistance to businesses interested in locating and expanding into the County including site selection, incentive negotiation and other due-diligence requests. We are here to help with any questions that you might have for starting, relocating, or expanding your business. Coordinated efforts through the County, the St. Johns County Chamber of Commerce, Industrial Development Authority (IDA) and other resource partners bring a team approach to positioning St. Johns County as a highly-desirable location of choice for business expansion and relocation.